Meanwhile, she also studied dance. 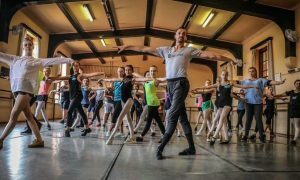 She trained in classical ballet and performed with a pre-professional ballet company in many classics, including The Nutcracker, Swan Lake and Cinderella. After high school, Salgado followed her artistic passions to New York City, where she earned a degree in Dance Performance from the Ailey/Fordham B.F.A. Program. She began work as a professional dancer in various concert dance groups and commercial work and continues to dance with CONTINUUM Contemporary/Ballet. She also teaches dance to young students and is on faculty at the Joffrey Ballet School. About four years ago, Salgado had an experience that would make her realize it was possible to fuse all of these artistic loves – visual art, dance and teaching – into one endeavor. At a taping of a Halloween episode of The Martha Stewart Show, Salgado had created costumes for herself and her friends. Following the taping, an editor from the show took great interest in Salgado’s artwork and encouraged her to delve into illustration, especially of children’s books. 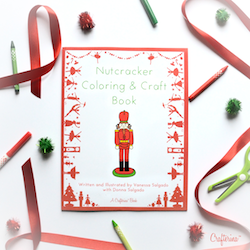 The Nutcracker Coloring and Craft Book, one of Crafterina’s latest products, will be available in time for the holiday season. Photo courtesy of Vanessa Salgado. Currently, Crafterina’s line of crafts include: a storybook that tells the tale of a young girl who creates crafts that help her go on dancing adventures; Nutcracker Ballet series crafts; paper doll sets; Halloween masks; and photo booth props. In September, Salgado premiered her first commercial on Crafterina’s YouTube Channel, which garnered attention from press, professionals within the dance field and was even the subject of a live “Twitter Chat.” Just in time for the holiday season, Crafterina will also release a Nutcracker Coloring and Craft Book. It’s impressive that, for the most part, Salgado is self-taught. With the influence of her mother and grandparents, who are artists themselves, along with a few graphic design courses in college and much independent study and self-practice, Salgado has now locked down her own style and aesthetic. She says she gets her inspiration for her crafts from specific ballets, nature and even her own students. Vanessa Salgado, the creator of Crafterina. Photo by Corey Melton. Each Crafterina craft is thoughtful and friendly for youngsters. The storybook is written in clean, positive language, the directions for the printable crafts make them easy to use, and there is acknowledgment of diversity. “Created with the desire for every child to be able to imagine themselves as the main character, we offer five additional styles of Crafterina that reflect the diverse and multi-cultural world we live in,” Salgado explains. Salgado hopes that her crafts can bring out a child’s creativity, sense of adventure and artistry at a young age. It seems appropriate that the creator of Crafterina is passionate about these things herself. To purchase Crafterina arts and crafts, check out Salgado’s Etsy shop at www.Crafterina.Etsy.com. For Crafterina storybooks, head to Crafterina.com, Amazon.com, BarnesandNoble.com or the iTunes Store. To keep up-to-date with exciting upcoming Crafterina projects, subscribe to the official newsletter here and follow Crafterina on Facebook. 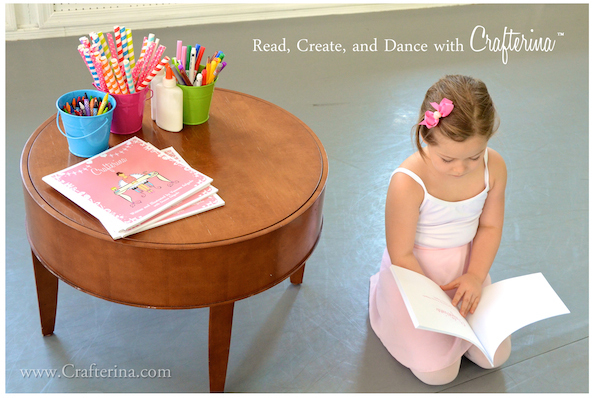 Photo (top): A young dancer enjoys the Crafterina Storybook. Photo by Kevin Moy.